Rising living standards and inefficient agricultural policy are exacerbating India’s food problem. In its ongoing effort to tame high food inflation in India, the central government recently decided to bring onions and potatoes under the purview of the Essential Commodities Act. The state governments will have to now act by fixing stock limits for these two items and penalising hoarding and black-marketing activities to keep prices in check. Other earlier measures, such as encouraging state governments to delist fruits and vegetables from the Agriculture Produce Marketing Committee (APMC) Act and fixing minimum export prices for onions and potatoes, were announced as part of the Modi government’s inflation control strategy. While this may bring some temporary relief, it will not tame inflation over the medium or long terms. India’s food economy is directly dependant on domestic production and agricultural output, monsoons, and domestic policies. The wholesale price index (WPI) and consumer price index (CPI) are regularly tracked to gauge the rise of prices in India. While food accounts for one-third of the WPI, its percentage of the CPI is almost 50 percent. Monsoons do have a significant impact on food inflation, but can’t solely be blamed for the persistent food inflation problem in India. Food inflation averaged 3.8 percent year on year in the eight-year period from 2000 to 2008. However, in the five years following the financial crisis it rose substantially, averaging 10.3 percent year on year and has remained at these levels despite slow GDP growth. Persistent food inflation has been a concern for policymakers in India as good monsoons and softer global food prices haven’t had an impact on domestic food prices. For an average Indian household, food still accounts for almost 50 percent of total expenditure. At a broader level, both demand and supply side factors have played a role, however policy implications may vary depending on different drivers of inflation for various subcomponents of the food basket. A closer look at the WPI food subcomponents and disaggregated data reveals that inflation has been broad-based across subcategories, affecting cereals, milk, eggs, fruits and vegetables, meat, pulses, edible oils, and other items. However, prices of protein items, fruits and vegetables have risen more than cereal prices. According to the Institute of Economic Growth, a 1 percent increase in per capita income leads to a 0.05 percent decline in demand for cereals and a 0.2 percent drop in demand for pulses. These goods are generally referred to as “inferior goods” in economic theory. For all other “normal goods,” however, consumption increases as per capita income rises. Thus a 1 percent increase in per capita income would increase the per capita consumption of vegetables, fruits, and milk by between 0.5 and 0.6 percent. 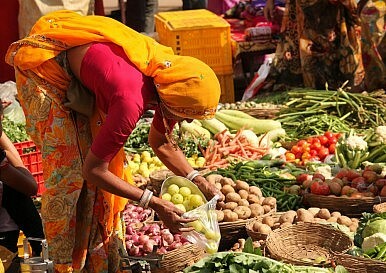 Consequently, rising per capita incomes in India have led to diversification of the Indian diet towards high-value products such as milk, meat, and eggs, leading to “protein inflation.” The National Sample Survey Organization’s (NSSO) household consumption expenditure survey indicates that the share of protein-rich items in overall food consumption has increased from 27.1 percent in 2004-05 to 32.5 percent in 2011-12 in rural areas. In urban areas the share rose from 29.9 percent to 33.0 percent during the same period. Demand-pull inflation thus plays an important role in the case of high value-added items like fruits, vegetables, and dairy products. On the supply side, agriculture wages account for almost 40 percent of the total cost of production. Since 2007, nominal rural wage growth has far outpaced overall inflation, resulting in higher real rural wages. Nominal wages increased 17.3 percent after 2008, compared to 6.2 percent in the period prior to it. The Mahatma Gandhi National Rural Employment Guarantee Scheme (MNREGS), which offers one hundred days of guaranteed wage employment in a financial year to rural workers, has increased the bargaining power of laborers by setting a floor for rural wages. The government’s Commission for Agriculture Costs and Prices (CACP) estimates that a 1 percent rise in wage inflation translates into a 0.3 percent rise in food inflation. At the same time, persistent food inflation itself results in higher wage inflation, thereby creating a strong wage-price spiral in the agricultural sector. But higher rural wages have not been accompanied by productivity gains in the farm sector, further fueling inflation. Thus the solution is to move toward mechanization and better farm technology in order to improve labor productivity in line with higher rural wages. Besides wages, other input costs have also risen substantially post 2008. The past five years have seen significant year-on-year increases in the price of key agriculture inputs like fertilizers (8 percent), fodder (20 percent), diesel (8 percent), electricity (8.7 percent), and tractors (5.4 percent). Moreover, India’s food price policy has the dual objective of providing minimum support prices (MSP) for the benefit of farmers, and subsidization of prices for the poor through a public distribution system (PDS). Currently MSP apply to 25 crops, which account for 30 percent of the WPI food basket. This is to incentivize farmers to produce some essential cereals. An increase in agricultural input costs post 2007-08 has resulted in higher support prices of cereals as MSP calculation follow a cost-plus approach. This has had a double impact. Not only does it lead to higher food prices directly, it also increases the burden of the food, fuel and fertilizer subsidy bill on the government. This translates into a higher fiscal deficit which further increases prices. Thus monetary policy alone is not sufficient to tackle inflation, and an emphasis on better fiscal management is needed. Lastly, India’s food supply chain is also fraught with inefficiencies, which result in artificial inflation. Malpractice and the monopoly of intermediaries under the APMC Act (under which farmers cannot sell produce direct to retailers) results in much higher margins (around 65 percent) over and above the primary producer’s price. Moreover, wastage due to underdeveloped agriculture infrastructure (lack of cold chains, transport facilities) is around 25 percent while an inefficient PDS has a leakage of around 40 percent. Thus the key drivers of inflation may vary across different food categories. For example India imports most of its edible oil and pulses, hence domestic prices of these commodities respond quickly to global prices. Domestic policies like MSP, stocking decisions, and public distribution play an important role in the price of cereals like wheat and rice. Broken supply chains, inefficient marketing infrastructure, and malpractice inflate the prices of fruits and vegetables. A food supply shock is generally temporary but it does lead to a sustained increase in food inflation if not tackled effectively through monetary and fiscal policy. Thus a multi-pronged strategy involving better fiscal management, a tight monetary policy, efficient supply chains, and improvements in productivity is the cure for the high food inflation problem in India. Prachi Priya is an economist at a top corporate house. The views here are her own.